OUR ORYX BABIES ARE FROM 2 DIFFERENT ORYX FEMALES. 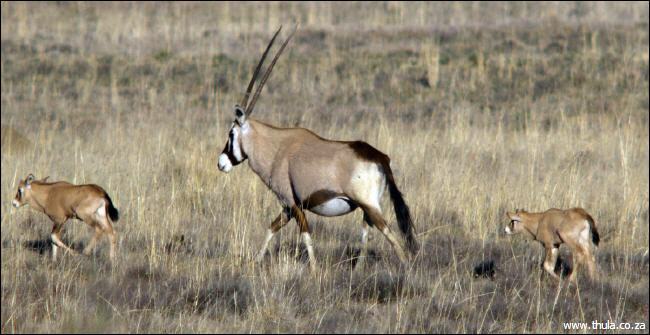 THE ONE IN FRONT OF THE ORYX MOTHER IS HER OWN (MALE) WAS BORN ON THE 18.09.2009 AND THE ONE BEHIND HER WAS BORN ON THE 27.09.2009 (MALE). NORMALY THE PARENTS ARE HIDDING THEIR BABIES FOR UPTO 4 WEEKS.